Hello there Steampunkers! Hopefully you guys are up for some world travelling if you came to see this article, because these locations are truly all over the map. In fact, of all five, only two of them are in the same country! I'll rank these as best as I can, by sheer level of beauty and ingenuity. My only regret is that I can't visit them all for you to truly tell you which is the best. I'll have to hope some of you try them out so I can live vicariously through you. So, with that, lets begin at number one! I'll admit something to you guys here. Truth Cafe took first by a landslide. Mostly because it is the most well known, frequently written about and, admittedly gorgeous, cafe or bar that I could find. People rave about it online, from giant recycled sawblade tables, to their inspired coffee dispensers hooked up to all that piping on the right of the picture, to even the uniform, a brown leather apron, which makes me think of a Victorian blacksmith or craftsman at his trade. They home roast every bean they serve in house, and they even sell online (and have been rated the world's best by the Daily Telegraph). If that's not a good enough reason to go there, I don't know what is. Though, the authenticity is even better, considering they're housed in a three-story Victorian-era warehouse. I'm not really sure if there's any way is could get better, period building, world's best coffee, and a gorgeous, well thought out decor that hopefully has you reaching for your passport some day soon. A couple more admissions- I will never be able to do this place justice with one picture. So, you need to look up videos of it, there are plenty. Why? 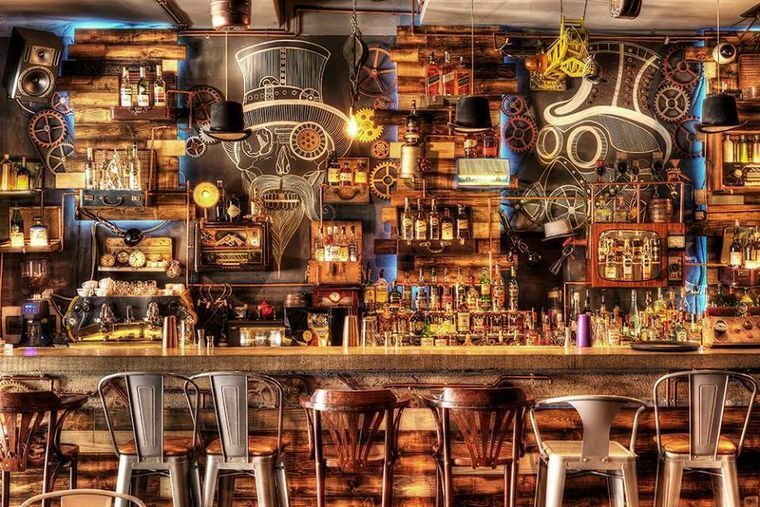 Because Enigma in Romania is the world's first kinetic steampunk bar. That's right, not only is this place full of live motion, but also mechanisms that have been stunning people since it opened. There are at least two moving humanoid statues, one on a bike, pedaling slowly and steadily inside the front door, and one with a plasma ball head, who I will readily say looks a little creepy, but in the best kind of way. Oh, and maybe best of all. That wall of gears? Each and every one of them turns, making the whole wall a statement peace for the art that the establishment was designed around! I couldn't find much about their drinks- but considering how popular and how much effort they've clearly put into it, I can't imagine their drinks are anything less than fantastic. I'm pretty sure it's safe to assume that the area of Cluj-Napoca, Romania has a very healthy steampunk culture. Especially when the decorations and artistry put into both locations in separate parts of the city, are so amazingly thought out. 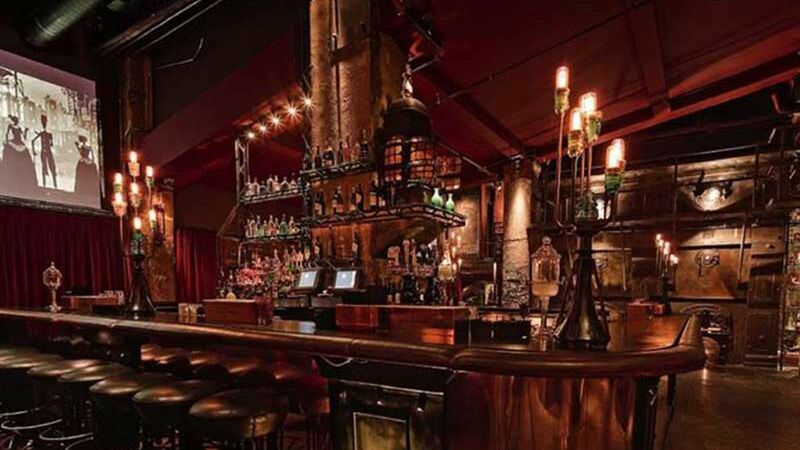 Okay, so it's not the world's only kinetic steampunk bar, but it is an incredibly creative place, featuring a gorgeous rustic wood bar front with the area behind the bar featuring beautiful, quirky steampunk head art, with top hats and gas masks included. And, of course, we can't forget the LED lit zeppelin that's coming out of their ceiling, it would be a real crime to ignore that feat of decoration and artistry! This one is the only one with multiple locations! Disney opened another location named the Edison in Florida as part of a nightlife complex in Walt Disney World. I'll confess, I found this based on the L.A. original location, but I find it rather exciting that Disney is recognizing the culture of steampunk as beneficial to their business. The image is of the original location, because I didn't want it to get confusing, but this part of the list is a two for one. I love the scaffolding in the background of the picture, as well as the yellow-lit vintage lightbulbs that really make it feel cozy and warm in there, it looks wonderfully inviting, especially on all the copper in the room. It's a little hard to describe much about this place, their website, what I understand, tells me that they were a bit of an overnight sensation with an indescribable atmosphere.When they opened, there was concern the concept wouldn't be received very easily, but, sure enough, it's a hit. I have to admit, the decorations of this bar/restaurant are quite fascinating. I mean, they've made their bartender's station into an airship, which is both ingenious and fascinating! I hope you enjoyed this list, and that it inspires you to go out and have an adventure! Steampunk is clearly growing nicely into something more than beautiful clothing and a few unique stories.